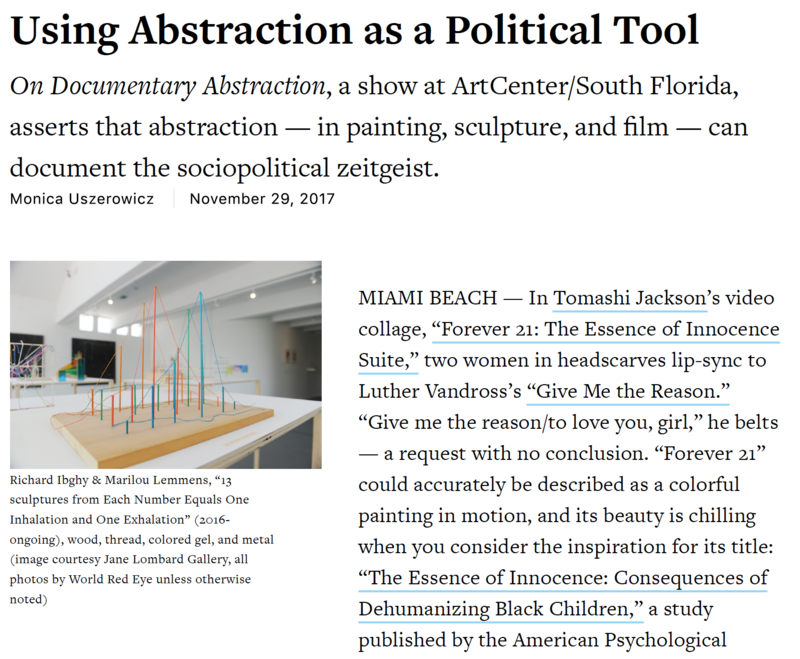 On Documentary Abstraction, a show at Oolite Arts, asserts that abstraction — in painting, sculpture, and film — can document the sociopolitical zeitgeist. MIAMI BEACH — In Tomashi Jackson’s video collage, “Forever 21: The Essence of Innocence Suite,” two women in headscarves lip-sync to Luther Vandross’s “Give Me the Reason.” “Give me the reason/to love you, girl,” he belts — a request with no conclusion. “Forever 21” could accurately be described as a colorful painting in motion, and its beauty is chilling when you consider the inspiration for its title: “The Essence of Innocence: Consequences of Dehumanizing Black Children,” a study published by the American Psychological Association. Black children, the study concluded, are perceived as less innocent than white children — they’re hardly considered children at all, which explains in part their subjection to brutal police violence. Give someone a reason to love them, Vandross seems to ask.